Recover the bonemold formula for Glover Mallory. Travel to Castle Karstaag Caverns. Recover the bonemold formula from Esmond Tyne. (Optional) Reveal the truth to an old friend. "So tell me... how's my brother Delvin?" For members of the Thieves Guild back in Skyrim, the local blacksmith of Raven Rock has a very familiar surname: Mallory. Glover Mallory has a house next to his smithy and to the left of the front door is a shadowmark. Approach Glover when he is working the forge between 8am and 8pm and ask about the shadowmark. He will confess his relation to Delvin Mallory back in The Ragged Flagon, saying things like: "So tell me... how's my brother Delvin? Still spending his nights at the Ragged Flagon trying to win Vex's heart?" He will however also say: "Damn layabout never even bothers to send his own flesh and blood a letter saying how he's doing. Can you imagine?" In the end, he will have a Thieves Guild-related job for you: "Eager to make some coin, eh? That's the spirit. I'll tell you what. The Guild's got a problem out here that I've been trying to deal with for years, but haven't been able to handle. A fellow Breton who went by the name Esmond Tyne showed up on my doorstep about a fortnight ago. He noticed the shadowmarks like you did, and I thought he was one of us." He will then proceed to tell you what Esmond Tyne stole: "It's my own formula for improved bonemold. Took me years to perfect." As for the whereabouts of Esmond, Glover only knows a bit: "Well, before he ran off, he was talking some nonsense about trying to fence goods to the rieklings at Castle Karstaag. I told him he was crazy to even think about talking to those vicious little buggers, but he wouldn't listen. I'd bet a fat purse of coin that he's either dead or hiding out up there." When you tell him you will retrieve the bonemold formula, he'll "make sure you're set up right". Castle Karstaag is a massive fortress of ice, located in the northwestern region of Solstheim. Your objective is the Castle Karstaag Caverns, located at the bottom of the waterfall west of Saering's Watch. Enter the Caverns and head upstream. Rieklings inhabit the cave and Esmond Tyne didn't make it very far in his attempt to fence goods to them. In the first huge chamber, he can be found dead with his lit lantern next to him. You can easily reach him by swimming silently, so you will never have to deal with the rieklings. Loot his corpse for the bonemold formula and various leveled loot and leave the Caverns the same way you came. "I... I can't believe it." Pick up Glover's Letter from the basement room and read through it. It solves the mystery about Sapphire from Riften and reveals that Glover is her real father. It tells the tale about how he ran away from the farm where she was born, only to return fifteen years later when she had been abducted by bandits. 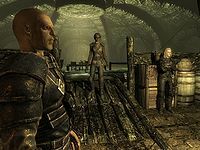 It also reveals why Glover chose to move to Solstheim, simply because he saw her in the Thieves Guild and couldn't bear to tell her the truth. Time to tell Sapphire the truth, so travel to Riften and seek out Sapphire. Hand her the letter and she will say: "I... I can't believe it. All those years on the farm, and my mother never told me about any of this. Words can't even begin to describe how much I appreciate you bringing this to me. Here, take this. I used to carry it for good luck, but I think you deserve it more than I do." She will then hand you an exquisite sapphire, a unique item worth 5000 gold. You must be a member of the Thieves Guild to do this quest. You need to have received your set of Thieves Guild armor from Tonilia in the Ragged Flagon, and you need to have asked both Vex and Delvin about extra work, to get the dialogue option to ask about the Shadowmark. The contents of Glover Mallory's house respawn after 10 days, making it possible to obtain several sets of the Blackguard's Armor. Glover's letter respawns, allowing you to give it to Sapphire and receive unlimited exquisite sapphires. If you attempt to turn in the quest to Mallory before sunrise, he may be at the nearby Earth Stone. If so, he won't begin his scripted dialogue to finish the quest, and will only have his normal non-quest dialogue options if engaged in conversation. Wait until after daybreak to approach him and he will begin talking to you to complete the quest. If the bonemold formula was found before the quest was started, Glover Mallory never asks you to retrieve it and the quest cannot be started. ? Open the console and type setstage DLC2TGQuest 5. You should be able to ask about the Thieves Guild problem and give him the formula once he mentions it. On the PC, it is possible to use the console to advance through the quest by entering setstage DLC2TGQuest stage, where stage is the number of the stage you wish to complete. It is not possible to un-complete (i.e. go back) quest stages, but it is possible to clear all stages of the quest using resetquest DLC2TGQuest. This page was last modified on 24 July 2018, at 05:30.